At OEM Group, we optimise productivity, helping you reach peak efficiency. By maximising on-site performance -in the safest way possible - your business can increase profitability. That's the bottom line. After identifying the most elegant solution for you and your budget, we design and deliver the most suitable equipment for the job. Everything we do is about optimising output. If there's a safer and more productive way of doing it, we'll find it. We're proud to be exclusive WA Distributors for Spitwater, Steprite, Jackrite and Westchock. Each of these innovative products is hand-picked and hand-assembled to optimise productivity - and improve safety - for our clients. We're also proudly WA owned and operated, so we understand the unique needs of this big country. No matter how remote the location, we're happy to meet you on-site and discuss your requirements. This might include an OEM Group special build (custom-made fabrication) or supplying one of our exclusive off-the-shelf products, like Steprite access platforms. Sometimes, the best solution is a combination of both. Whatever outcome we recommend, you can rest assured we'll reduce your downtime, improve safety and increase efficiency. PRODUCTS & SERVICES AT A GLANCE. The OEM Group has distributed Spitwater pressure cleaners for over 25 years. The largest manufacturer of pressure cleaners in Australia, these compact but powerful machines are built tough for Aussie conditions. To complement your Spitwater Pressure Cleaner, we sell and supply a vast range of Spitwater spare parts and accessories. From filters to turbo nozzles, we keep your machine running at peak performance. A safe solution for working at heights, Steprite offers a wide-range of engineered work ladder platforms. Constructed from highst-grade aluminium, they comply with all health and safety requirements. Perfect for your mechanical or manufacturing workshop. Fit-for-purpose metal fabrication is our specialty - including Aluminum. Designed in-house, our 'Custom Design' team offer tailor-made industrial solutions, built specifically to solve any on-site challenge. Our qualified technicians can expertly service all makes and models of Spitwater equipment. To optimise efficiency, we schedule a professional maintenance plan. With a vast hire fleet suiting almost all applications, we can offer long or short term hire solutions, contact us today. We supply a range of jacking stands for all applications, from light vehicles to the heaviest earthmovers, loaders and dozers - even military tanks. We can also design and fabricate bespoke jacking stands and tailor-made bracing support structures. For a reliable, efficient source of heating, Jetfire portable heaters are perfect for the industrial and agricultural sector. You can heat warehouses, factories, workshops and breeding sheds, or quickly dry and cure materials of a large commercial quantity. Made for the rugged requirements of heavy industry, Westchock products are built tough: internal crush-resistant supports are moulded into one clever design. Includes easy grab handles for operator comfort and safety. To commercial workshops, contract cleaning or heavy industry requirements, there's a Spitwater Vacuum Cleaner to suit you. No matter the task at hand - be it damp or dry dirt, even water or slime - the Spitwater range has got it covered. With some of the world's biggest tidal changes in Australia, our innovative designs make it safer and easier to access your vessels. 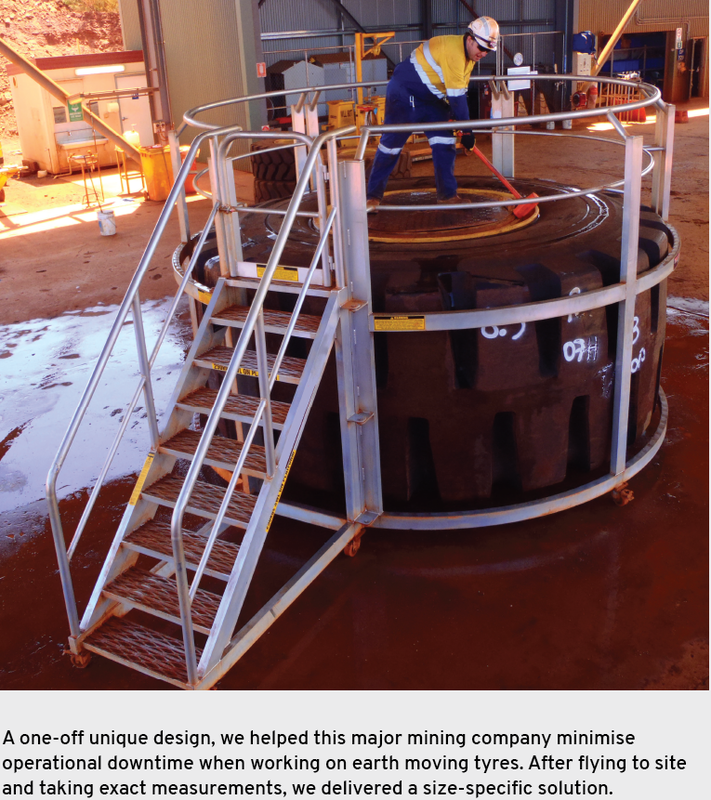 With patents pending for some of these innovative designs, our in-house Tidal Access specialist is considered one of Australia's leading experts in this area. This innovative system is revolutionising productivity and safety. With a Diacon Conveyor System, you can massively reduce conveyor belt spillage and increase capacity of your conveyor system by up to 30%.